Funny Or Die, one of the best comedy websites where you can get your daily dose of laughs, has just released a News Flash app for iPhone, iPad and iPod Touch devices. Funny Or Die has been around since 2007, and their viral content has spread across all social networks, gathering millions of views in the process. The FOD News Flash app delivers a curated list of today’s stories with a twist of humor, in a condensed and easy to read format. Even the most serious topic can easily become ridiculous and laugh inducing, but why not? We see so much tragedy every day, perhaps it’s best if we don’t take every single piece of bad news to heart. Every story features a headline, a looping video and a joke that mocks the report. 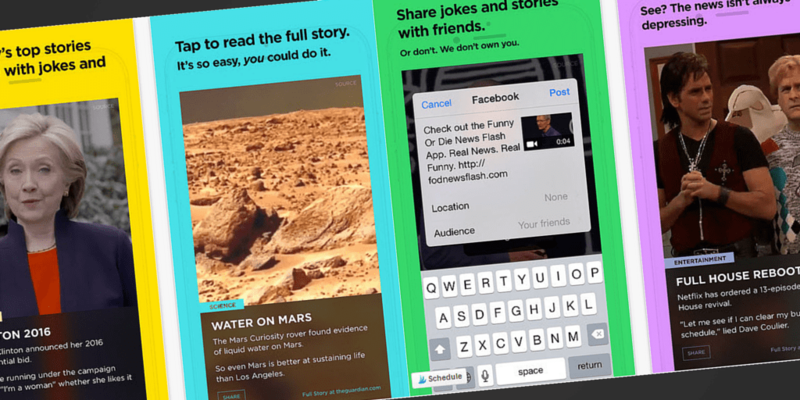 Users can quickly share any story they like or click on the related link to read the full story. All the content published in the News Flash app is managed by the FOD News team so you can be sure you’re getting the top stories of the day. The app is not available for Android yet, but it is under development, which suggests Funny Or Die News Flash will land on the platform in the near future. This is not the first app Funny Or Die has released this year though. Back in January, the team launched a weather app, called Funny Or Die Weather, for both iOS and Android. Like you might suspect, this particular app has the special skill of making an imminent tornado seem like it’s a good time to go for a spin. Are you excited about Funny Or Die News Flash? What’s your favorite headline for today? Follow us on Pinterest, Google+, Facebook and Twitter to receive our latest apps & game reviews, news, tips and how tos for Android, iOS and Windows Phone. You’re also welcome to join the Pocketmeta forums for more app related discussion!